Wilbur and Orville Wright were sons of a bishop who impressed them with the importance of "courage and good character, worthy purpose and perseverance." Their home had no indoor plumbing or electricity, but a substantial library. While still in high school, Orville began publishing a newspaper in a print shop in the backyard. One article was on the 1889 death of their mother. By 1893 they closed the paper but opened a bicycle business and actually manufactured the popular item, earning a good living. At age 25 Orville was struck by typhoid fever that hit 105 degrees, leaving him close to death. It was a month before he could sit up in bed. During this time he began reading about the German glider enthusiast, Otto Lilienthal, who had designed, built and flew a dozen gliders. They had wings like a bird, made of muslin stretched over a frame of willow. He hung below. He went to steep hills, where he ran down a slope into the wind, lifting him off the ground. Lilienthal had himself photographed in action, as the daring "Flying Man" which appeared worldwide. Unfortunately, he died on one flight. Reading about Lilienthal aroused an intense interest in the brothers. After reading books about flight, Wilbur wrote "One of the most important letters of his life," according to David McCullough's absorbing recent book, "The Wright Brothers." Wilbur told the Smithsonian Institution, "I wish to avail myself of all that is already known" about human flight. He was given a list of many books. That motivated the brothers to design and build their own experimental glider kite in 1899. Made of split bamboo and paper with a wingspan of five feet, it had two wings for greater stability, and cords so an operator on the ground could control wing warping. It worked to a degree, but the brothers realized the time had come to work on a man-carrying glider. What was needed was a place with steady, substantial winds. They wrote the U.S. Weather Bureau and were advised the best place was the Outer Banks of North Carolina. They built a full-sized glider with a 17 foot wingspan, packed it up and shipped it to North Carolina. The glider had to be dragged four miles to Kill Devil Hills. In mid-October, 1900 Wilbur enjoyed flights of 300-400 feet, hitting speeds of 30 miles an hour. But the next summer, the glider nosed straight into the ground only a few feet from where it started. The curvature of the wings was too great and had to be changed. Back in Dayton they devised and built a small-scale wind tunnel - a remarkable innovation used today. Theirs was a wooden box 6 feet long, with a fan at one end run by a gasoline engine, since they had no electricity. For two months the brothers tested 38 different wing surfaces made of hacksaw blades hammered into a variety of shapes. It was a slow tedious process, but they learned how to build wings that would fly. That led to a new design with wings 32 feet long. They made 50 glides in three days. Orville proposed that the rear rudder be hinged and linked to the wing warping. That so improved the glider's control, they flew 1,000 flights. "They knew they had solved the problem of flight" and "acquired the knowledge and skill to fly." wrote McCullough. "Now they only had to build a motor." 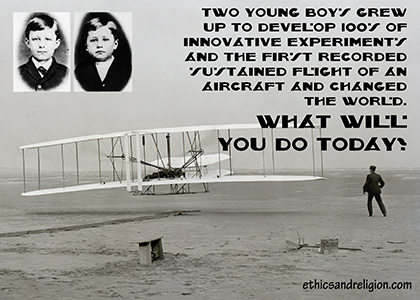 They did so, and took their first flight on December 17, 1903, and had it photographed to document it. Their pioneering changed world history. But not immediately. They designed a catapult to enable their plane to take off without a headwind. When they flew it in Dayton, the local newspaper refused to cover the story. Senator Henry Cabot Lodge wrote President Theodore Roosevelt urging the U.S. Government to consider support. It did not. However, the French Government showed interest if flight were demonstrated. Flights in France were covered by an amazed press. "MARVELOUS PERFORMANCE" read one headline. On one flight Wilbur flew for 91 minutes, a record. He landed a contract. A new version of their plane allowed the pilot to sit in a chair, rather than lie flat, and to take a passenger. However, on one flight the propeller broke and the plane crashed straight down from a height of 125 feet. A passenger was killed and Orville suffered a broken hip, leg and four ribs. His sister nursed him back to health. Their perseverance overcame many setbacks. Norman Cousins once wrote, "Optimism doesn't wait on facts. It deals with prospects. Pessimism is a waste of time."